Selecta Recreation Park Malang, A Charming Flower Garden. The wretched stone and is one of the cities in Indonesia that has many beautiful sights, such as the Antique Car Museum, Tours of the night in the square stone, the stone of the Secret Zoo, East Java Tourism Park II and Batu Night Spectacular. One of the beauties of the stone town can be found in recreational park Selecta, rocks, East Java. Yes, the stone town did indeed once part of Malang, however, has now stood on its own. However people still often refer to the stone town as the city of Malang. Religion is one of the oldest tourist attractions in stone town, 4 km north from the center of the stone and is 25 km from the Centre of the city of Malang. The layout of the Religion in the village of Tulungrejo, Kecamatan Bumiaji, Batu, East Java, and founded in 1930 's by a Netherlands named Ruyter de Wildt. This still leaves the building the feel of ancient architecture with the Netherlands Netherlands. 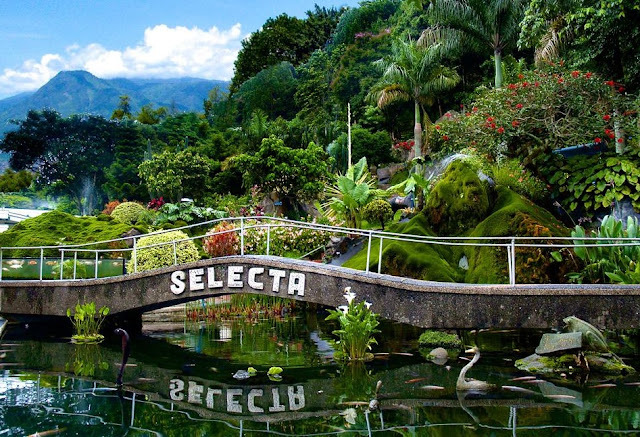 This is one of the charms of Selecta and the recreational park became the dream of foreign tourists as well as locals. Selecta theme park is divided into four parts, namely, theme parks, gardens, restaurants, and hotels. Although these have been standing Religion tours long ago and already many of the latest tourist attractions in the city of Stone which compete with this recreational park, the charm and the beauty of Religion not fission by time. It provides several recreational parks unit that can be enjoyed by the visitors, such as a pool, flower garden, outbound, water park, fish ponds, flying fox, jogging area, the racetrack, the giant aquarium, and much more. The location of the garden of Selecta altitude 1100 m above sea level. The cool air that average-temperature 17 degrees Celsius to make the visitors happy to linger in this place. The entrance ticket to recreation park Selecta only Rp. 25.000,-for individuals, and if you are with a large Entourage, ticket prices can be at a discount to Rp. 20.000,-per person. And if visitors want to enjoy rides in the Park's existing recreation religion then it must pay again with different prices between Rp. 5000,-until Rp. 20.000,-only. One of the most sought-after tourist destinations in Selecta is Selecta flower garden. The assortment of wildflowers along the Park has even been entered so you can enjoy the garden area. An area of nearly 18 acres are covered by different types of flowers, either we come across to plant flowers which is rare. Kana is a type of flower flowers that dominate the grounds area, both of which are red, yellow, or pink. Other types of flowers like the Chrysanthemum flower and pamper the senses were also color your eyes in the flower garden of this Religion. Because of the natural scenery in Garden this very beautiful Selecta recreation, no wonder many visitors to capture its beauty with a camera that they bring. Even some of the couples who are getting married to perpetuate their prewedding photos in the most beautiful flower garden. As tourist attractions, garden flower Selecta indeed serves a variety of beauty that can satisfy its visitors. Even this is often called the flower garden similar to the Flower Garden Keukenhof in the Netherlands known as the mascot of this Windmill country because of its beauty. Though her beauty is very tempting, you are not permitted to pluck the flowers in the flower garden of this Religion. You are only allowed to capture only in the photograph together with family or friends. One of the points of interest within the Park area Recreation Religion this is the highest peak of Selecta. To get there, visitors can down a footpath on the right side lies the garden of colorful flowers and of course, it's soothing eye and removes the tiredness of everyday bustle. Along with its development, Selecta recreation park is also equipped with tourist facilities such as area horse racing, swimming pool, outbound, and flying fox which you can enjoy while on vacation to this place. Food prepared on-site restaurant is also variegated that make your vacation become more enjoyable. If you already feel sated these Selecta recreation areas surround, you can stay at a hotel that has been provided by the tariff price. Room provided varied, starting price Rp 450.000,-until Rp. 2.300.000,-. Surely the presence of the Inn makes it easy for visitors to the Park Recreation Religion down all the playgrounds that exist there.